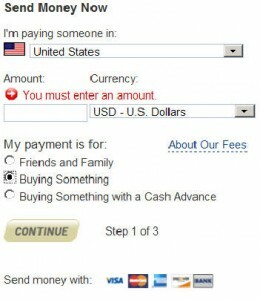 If you have a PayPal account, click HERE to login to PayPal. 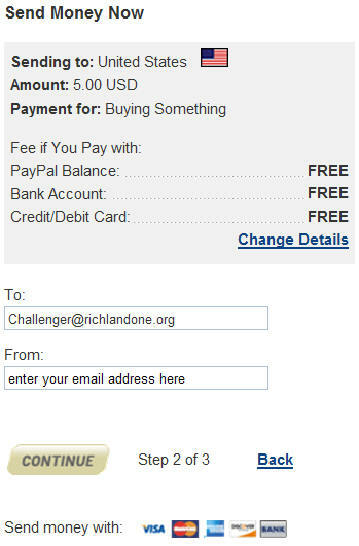 Send your payment TO Challenger@richlandone.org. In the MESSAGE box (in Email to Recipient), please put the date of your visit and the name of the person, group, or organization that the registration was made in. Our Mission Secretary will contact you to confirm that payment has been received. 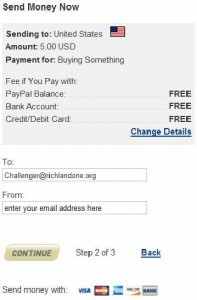 If you do NOT have a PayPal account, click HERE to submit your payment via PayPal. After clicking the link above, your browser will be directed to the PayPal home page. Click on the “Send Money” button near the top of the screen. For “I’m paying someone in:”, choose UNITED STATES. For “Currency”, choose USD – U.S. Dollars. For “My payment is for”, choose Buying Something. If you get an error message and need assistance, please feel free to contact use at 803-929-3951 or Challenger@richlandone.org. On the next “Send Money Now” window, for “Email address”, enter the email address you want to receive the email confirmation from PayPal. In the next window, for “Country or region”, choose United States. For “Email address”, use the email address you want to receive the email confirmation from PayPal. For “Choose a password”, create a password for PayPal. It should not be the same password you use for your email account. For “Re-enter password”, enter the same password. For “First name” and “Last name”, enter your first and last name (as it appears on your credit card). For “Address line 1”, “City”, “State”, and “ZIP code”, enter the address that your credit card statement is mailed to. For “Phone number”, enter your phone number (with area code). For “Credit Card number”, “Expiration date”, and “CSC”, enter the information from your credit card. When all the information on the screen is correct, click Agree and Create Account. On the next page, the “Description” should have Payment To: Challenger@richlandone.org. Near the bottom of that same page, in the “Message” for “Email to recipient”, enter the date of your visit and the name of the person, group, or organization that the registration was made in. At the bottom of that page, click the SEND MONEY button. You will go to a confirmation page from PayPal indicating that the money was sent. You will also be contacted by our Mission Secretary to confirm that we have received payment.